Autodesk’s latest InfraWorks update includes a connection with Esri’s ArcGIS Online software, which allows InfraWorks users to import geographic information system (GIS) data into a BIM model. The update, which is the result of a 2017 alliance between the two companies, has brought the question of BIM vs. GIS back into the spotlight. For those who haven’t been following the topic that closely, the question is: what is the difference between BIM and GIS, what are they both good at, and why are industry professionals so keen on bringing them together? Building information modeling, or BIM, is a process involving the creation of digital representations of the physical and functional characteristics of built spaces. GIS is any program designed to store, analyze and present spatial or geographic information in relation to Earth’s surface. While the two technologies may sound similar, they’re different both in the things they model and in their intent. While GIS models spaces and objects in relation to Earth's surface, BIM models specific, manmade structures, like buildings or infrastructure projects. BIM also offers more structured 3D visualization of spaces, whereas GIS relies more on 2D visualization and is customizable, offering a way to compare multiple datasets. Because of the differences between the two technologies, much ink has been spilled over which one is “better.” The highly publicized 2011 Autodesk University “Great BIM vs. GIS Debate” pitted BIM and GIS aficionados against each other. But instead of arriving at a definitive conclusion, the debate highlighted the unique advantages of both technologies. Since GIS is linked to geography instead of structure, it’s good for selecting potential locations for a project before it’s designed or built, as well as looking at multisite projects. The customizability of the software, and the fact that it’s not linked to complex 3D visualization, means that multiple people can use GIS maps for different purposes. Essentially, GIS works as a data unifier, enabling users to pull together disparate datasets in a way that BIM can’t manage. BIM is a far more rigid system, but its defined 3D visualization lets stakeholders look at projects in detail and make informed and coordinated decisions throughout the building process. The technology also assists stakeholders during the maintenance phase, when people are concerned with the working parts of a building. BIM and GIS have their own unique strengths and weaknesses. Instead of attempting to determine which technology is “better” or “worse,” the last few years have seen a steady increase in the number of professionals looking to combine them. Until recently, it was difficult to integrate BIM and GIS data because of the challenges of transferring files between them: there wasn’t an official pathway between the two systems. Professionals who were interested in using the technologies together resorted to workarounds like converting individual BIM elements to GIS features through intermediary files, making entire BIM files into complex features on a GIS map, or using BIM-derived data as a complex point marker symbol. But, in the past few years, companies have become more interested in building further “official” connections between the two technologies. Part of this change has been driven by companies like Bentley, which has both BIM and GIS properties. But the most dramatic news story in the past year has been the partnership between BIM-focused Autodesk and GIS giant Esri. Since the two companies announced their partnership at last November’s Autodesk University, they have been developing links between their separate properties. The most recent development in the news has been InfraWorks’ new Autodesk Connector, which allows InfraWorks users to import data from ArcGIS files. 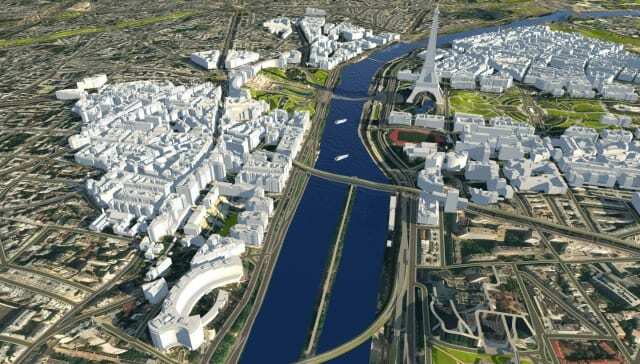 But during Esri’s annual UK conference in May, the company announced that there was also a second phase to its plan: one connecting ArcGIS with Autodesk’s Revit and BIM 360 programs, where ArcGIS will be able to read native Revit files. Autodesk has made some headway in the BIM industry on its own, but since Esri controls an estimated 43 percent of the GIS market, the alliance has propelled it far further than it could go on its own. And, since Esri was previously focused primarily on its GIS capabilities, the company wanted to stop relying on imported IFC files to let users work with BIM. Both companies are benefitting from this partnership, as are BIM- and GIS-using consumers.